The Department of Standardisation and Metrology under the Ministry of Science and Technology will carry out fuel checks at petrol stations across the country this year to ensure products comply with the standards set by the government. A water supply project, built by the China North Industries Group Corporation Limited (NORINCO), has been completed and handed over to the owner in Lao capital Vientiane Wednewday. Cambodian Deputy Prime Minister Hor Namhong said that Cambodia and Laos pledged to complete border demarcation to transform the border areas to become “peace and development” zone, speaking in a courtesy call with Amphay Kindavong, newly appointed Lao Ambassador to Cambodia, at the Cambodian-Chinese Friendship Palace in Phnom Penh. It’s hard to manage what you can’t count. The same is true whether trying to manage a fish population or a group of fish conservation areas. Laos will continue to work with its development partners including the International Labour Organisation (ILO) for the ongoing protection of workers’ rights and benefits. The Forest Research Centre under the National Agriculture and Forestry Research Institute (NAFRI) will produce 100,000 saplings this year as part of government efforts to restore forest cover to 70 per cent of the country by 2020. As part of its mission to catalyze freedom of faith worldwide, the Institute for Global Engagement (IGE) will be conducting its annual visit to Vietnam and Laos from March 26-April 3. This is the story of the Laos Buffalo Dairy, an Australian and American-led social enterprise in Laos, and the local Lao people who have benefited because of it. Deputy Prime Minister and Minister of Finance, Mr Somdy Duangdy, signed a ministerial guideline earlier this month defining the new procedures state agencies must comply with when making use of state funds. The price of bananas in production areas in Yunnan, Myanmar, and Laos was quite weak in the first half of last week, and the price is still slightly falling in some areas, but in the second half of last week the price began to rise again in many banana production areas in Yunnan and Laos. Officials from Xayaboury province and village leaders from Ban Navaen met with staff from World Wide Fund for Nature in Laos (WWF-Laos) in Phiang district earlier this month to review the outcome of the survey and mapping of household land use and holdings, income, and other socio-economic and agricultural parameters. Kaya-Iloilo conceded a late goal to settle for a 1-1 draw against Lao Toyota in the start of its AFC Cup campaign at the National Stadium in Vientiane, Laos. 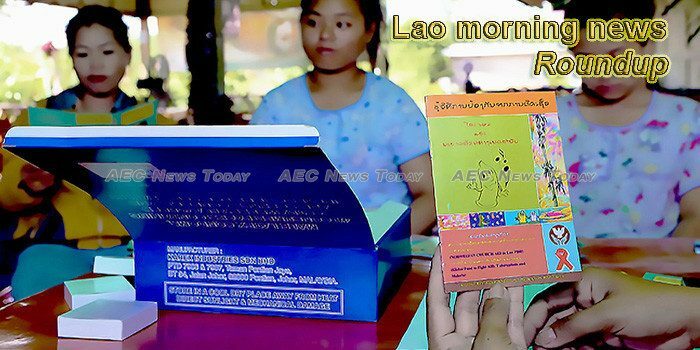 This week’s Lao morning news feature photo acknowledges Zero Discrimination Day, March 1.